We've been hearing for a while that the Vine app for Android is on its way, and it looks like today is finally the day that the app drops into the Google Play Store. The micro-video app has been steadily gaining steam on iOS since its release, and as part of today's announcement, Vine says that the platform has crossed 13M users, a number that's surely to rise quickly from here. 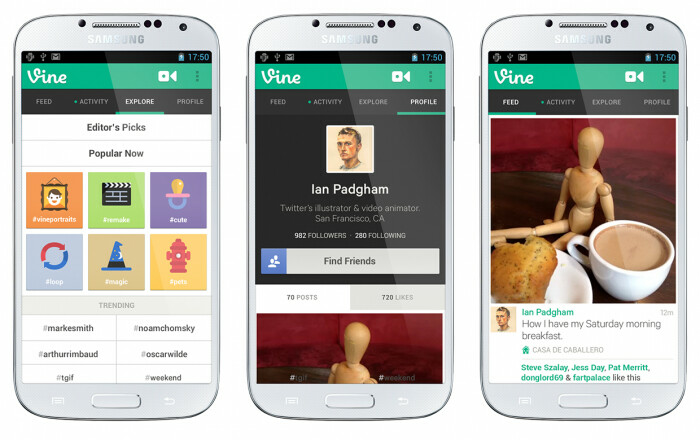 The team does warn that Vine for Android does not yet have feature parity with its iOS counterpart, but that the app will be updated quickly to add features like front-facing camera support, search, mentions and hashtags, and the ability to share to Facebook. And, going beyond that, the team has promised "features that could exist only on Android." As of the time of this writing, the app hadn't gone live just yet, but it should show up in the Play Store at some point today. You'll need an Android device running 4.0+ to use the app, and you'll find it here (eventually). Sad day for iOS exclusive user. All the thumb downs wouldn't lessen their hurt. Especially the statement of, "features that could exist only on Android." would really trick them off. Sign!.. pay so much for a restricted mediocre product. But a good day for mixed iOS/Android households like mine. I think Vine's pretty cool, and I would use it, but no way would I switch to the iPhone for it. Nowadays I only use iPad for knowtilus browser to brush up on my second language. Nothing else appeal to me at the iOS platform. If Knowtilus come to Android I would dump my iPad in a heartbeat. "As of the time of this writing, the app hadn't gone live just yet..."
Speaking of vine, and good vine application? Types, history, recommendations etc. isnt vine stupid? i still dont understand. if i want to take a 1-12 second video, why wouldnt i just use my phones video recorder and then upload it where i want? what if i start "vining" and the event is a bit longer than i expected and goes beyond 12 seconds? silly to me. I didn't get it at first either, but it's sort of a Twitter type thing. It's quite a challenge to make an interesting/entertaining video that's only 6 seconds long. People have done some really cool stop-motion with it. It's more fun to watch than describe. It's a crippled version. Doesn't even have a search function. What the hell is vine? cool, i've got it. not sure how often i'll use it though. Androids vine video quality is s**tty and isn't in sync to the audio. That's the benefit of iOS apps over androids.. We have better quality. This excuse was good few years ago but not today. Also don't forget about Apple Maps "quality" and iPhone 5 resolution incompatibility with older apps. And if you still say that iOS apps has higher quality, then why statistics says that they tend to crash more.